Rahu Ketu is known as the nodes of the Moon. Rahu is the North Node and Ketu is the South Node. Rahu and Ketu have the prime importance in Vedic Astrology. They are called as Chayya Grahas (shadow planets). They have no material and are not physically exist. Even their impact is full of strength and divine meaning. With their shadowy nature, they act on an emotional level. It is always difficult to count their effect because they affect internally. Rahu and Ketu are nodal points but got planetary status due to the blessing of Goddess Durga. The seven days of the week are believed to be ruled by the first 7 of the Navagrahas, such as Monday by Moon, Tuesday by Mars, Wednesday by Mercury, Thursday by Jupiter, Friday by Venus and Saturday by Saturn. Rahu and Kethu do not have separate days, but both are said to rule 1.5 hours each, every day. The time period ruled by Rahu is known as Rahu Kaal or Rahu Kalam, and the 1.5 hours ruled by Kethu is known as Yama Kandam. 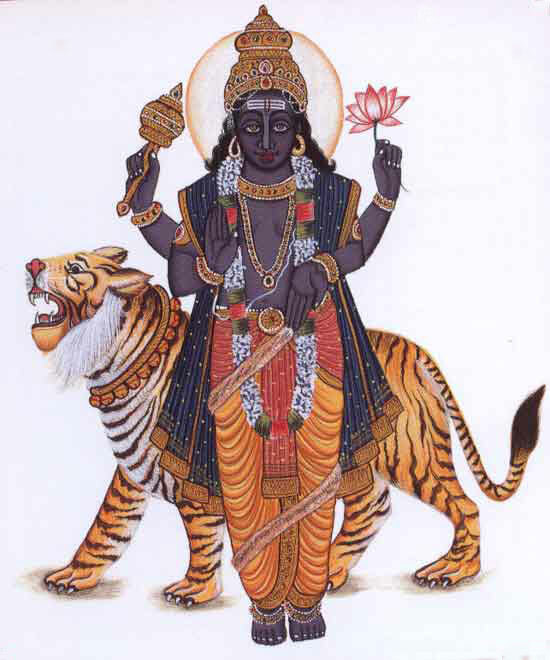 Rahu Kaal and Yama Kandam are considered inauspicious by Hindus, to carry out any important activities. Although Rahu kaalam period is considered inauspicious, it is considered auspicious to pray during this time. It is considered auspicious to light a lemon lamp to Goddess Durga at any Durga Temple on Tuesdays or Fridays or Sundays during the Rahu Kala period. The lamp should be lit facing Goddess Durga. Lamp should be lit facing east or west direction. It is believed that Goddess Durga fulfills the desires of women. Goddess Durga is known for protecting girls and women, she is Shakti. The word Shakti in Sanskrit means “Sacred feminine force”. She is known as Jagatmata (Mother of the World). It is considered very auspicious to pray her. Women who desire to get married, who desire for a child, women who pray for a happy married life and for a long life of their husbands, pray to the Goddess Durga by lighting a lemon lamp during the Rahu Kaala period on Tuesdays or Fridays which are believed to be the days of the Devi. Inverting a freshly cut and squeezed lime cover, then remove all the hair present inside and light a ghee lamp in its inverted cover (insides turned into a lamp) during Rahu Kalam time helps to nullify the negative effects of Rahu and get the blessings of Goddess Durga. Mother Durga is the power that guides and protects the devotee’s spiritual practice form its many danger and pitfalls. So, by performing this Rahu Kalam deepam, Mother Durga will bestow peace and prosperity in our life. Light this lemon lamp in any Durga Temple. The squeezed juice can be offered to Goddess as neivedyam and can be in taken as prasadam. Performing Rahu kala pooja every day in respective Rahu kala timings will yield beneficial effects. However, based on the problems few days in a week are assigned specifically. For delay in marriage, to get rid of obstacle in career, debt problems, bonding between brothers, problems related site/plot and houses, to get rid from accidents perform Rahu Kala pooja on Tuesdays. To fulfill individual desires, to get rid of unwanted expenses, for child birth perform Rahu Kala pooja on Fridays. To subdue the affect of sickness, fear of enemies, increase the bonding between kids and the parents, for abroad opportunities perform Rahu Kala pooja on Sundays. Rahu Kala pooja is always preferred performing in the temples only. In case, if it is not possible to go to temple on genuine reasons one can perform Rahu Kala at Home with following the below procedure. One should observe fasting till you complete the pooja. But, people who are not able to be in fasting can have milk and fruits. Clean the Pooja Room, sprinkle water and decorate it with Kolams (rangoli patterns). Place the banana leaf (Tip of Banana Leaf to be facing North) on a clean wooden plank (mane). Spread Raw Rice (Pachai Arisi) in the center of the leaf and in the center of rice place a small quantity of Thuvaram paruppu (Toor dhal). In the center of above setup place the Kuthu Vilakku or Kamakshi Vilakku and visualize this lamp as Goddess Durga and offer flowers and apply kumkum to it. Light the lemon lamp with ghee or oil in front of it by extracting the juice from the lemon and collect the same in an container. Scoop out everything inside the lemon, and turn it inside out, so it becomes like a cup. Now introduce a thread or a wicker or a ball of cotton shaped with a wicker on top and fill the lemon with ghee or oil. Use Oleander (Sevvarali poo) flowers or yellow colored flowers for pooja. Chant known Durga slokas. Offer Kumkuma archana by chanting Goddess Durga Potri. Offer curd rice or milk pudding (Pal Payasam) as neivedyam (prasadam) to Goddess along with preparing sweet drink in the extracted juice from the lemon. After completing the pooja, offer the prasadam to any women along with some auspicious items like kumkuma, arishina etc. You can now consume the prasadam. After Rahu Kala timings, move the lamp i.e. Kuthu Vilakku or Kamakshi Vilakku slightly towards north direction and finish this pooja. rahu kala pooja celebrate in home is good for family.